Lake Ontario shore approximately half way between the cities of Buffalo and Rochester. We are a small, close knit society set in rural Orleans County. Our community’s population is close to 2800 people. The largest employers in Kendall are the Kendall School District and several farms varying in size from a few hundred acres to several thousand acre complexes. 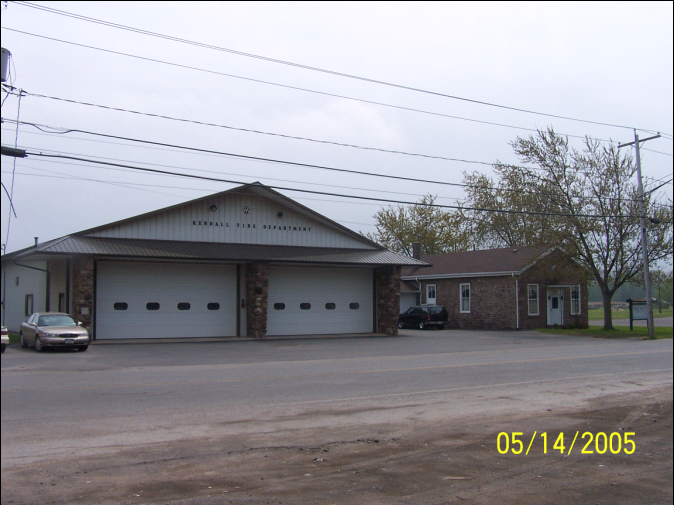 The second entity, The Kendall Fire Department, provides the members to operate the Fire Districts equipment and owns the property and building where the Districts equipment is housed. It also owns, maintains, and operates the totally volunteer, no charge, Ambulance service. The Fire Departments monetary funds are generated by fund raisers such as the Annual Carnival in July and the Turkey Raffle in November along with any donations given directly or indirectly through the United Way. (Our United Way # is 2109). These funds are used for building utilities, maintenance, insurance, improvements, uniforms, ambulance supplies and maintenance, medical training, new ambulance purchase, and associated fees. 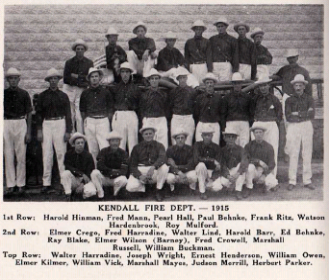 On March 18, 1912 the Fire Commissioners of the Town of Kendall met for the purpose of organizing a Fire Company. At a second meeting in June of that year a Chemical Company of 15 members and a Hook and Ladder Company of 14 members were organized. F. J. Whitehouse was elected chief. The original Fire District extended approximately from the present site of the Elementary School on the and western outskirts of the village. A canvas was made of the town for subscriptions to purchase a piece of fire apparatus, and as not enough money was subscribed, the deficit had to be guaranteed by the firemen. 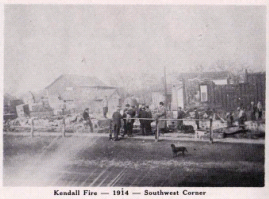 On September 16, 1913, fire broke out on the east side of main street. As the only apparatus consisted of bucket brigades, a blacksmith shop, hardware store, harness shop, pool room, dentist office, and another unoccupied building were consumed by the flames. Harvester Company to build a motor truck fire apparatus. This apparatus consisted of a Gould Piston was constructed at Hilton, New York. 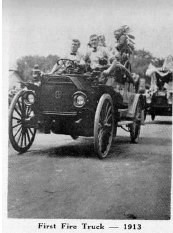 As this was said to be the first self-propelled fire apparatus with a This fire pointed out the need of better fire protection and a contract was signed with the International motor operated pump "between the rivers" and one of the first, if not the first, in the entire state, a women This fire pointed out the need of better fire protection and a contract was signed with the International was heard to exclaim when it was delivered on December 30, 1913, "Kendall against the world." A large cistern was constructed at the Methodist Church as a source of water supply. At this time an Engine Company, a Hose Company and a Hook and Ladder and Chemical Company of 15 members each were formed. Mr. Lucas operated a store on the ground floor. At 4:00 am when a fire was discovered, the interior was a mass of flames and it was impossible to get the hose. The firemen had to rely on the small hose carried on the truck and an inadequate water supply. As a result, six businesses were lost and the firemen were hard pressed to save nearby dwellings. There being no snow plows to open the roads during the first years the new truck was in operation, the firemen badly handicapped in answering some calls outside of the village. On some occasions they were unable to reach the scene at all. 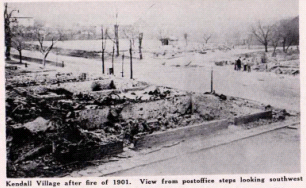 In August, 1926, another major fire destroyed the Hollwedel Vinegar Plant, the towns leading industry. Also lost was a large warehouse. In 1928 a petition was drawn up by the tax payers of the town outside of the Fire District for fire protection. The petition was approved, and the Fire District then included the entire town with the exception of those parcels of land which touched on the Norway Road. A fire tax was levied and a new truck was purchased. The present firemen's field was purchased in 1933 at the rate of $65 per acre. As a fund raising project a Field Day was held with the gross receipts of $491.34 and a net profit of $271.63. This project has been continued throughout the years with ever increasing size and popularity. Also the firemen sponsored a very successful baseball team for several years. 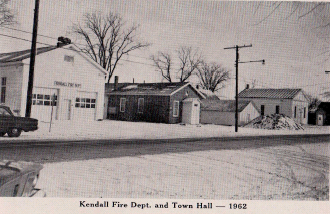 Engine Company, Hose Company and Chemical Company were combined under the name of the Kendall Fire Department, Inc.
During the first years of the company, meetings were held in various places, such as stores and homes. 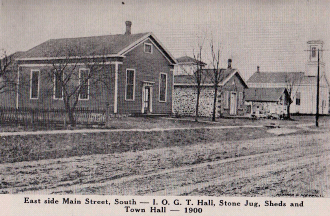 As the members wished to have a fire house, The I.O.G.T. building and grounds, known as the gymnasium property, was purchased for $600. Extensive alterations were made over a period of years. 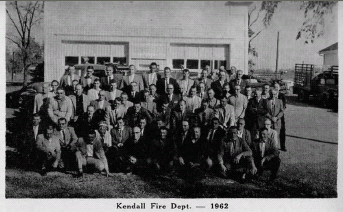 The Annual Convention of the Lake Shore Volunteer Firemen's Association, of which Kendall was a member, was held in Kendall on August 11-13, 1938. As an adequate water supply was the main problem at nearly all rural fires, a tank truck with 1,500 gallon capacity was purchased in 1943. With the addition of more equipment, the number of active memebers was increased from 45 to 60. The I.O.G.T. was purchased in 1947 and a year later the Ladies Auxiliary was formed. Over the next several years the I.O.G.T. hall was completely renovated, including the installation of a modern kitchen. As some of the fire fighting equipment was becoming obsolete, a Bean High Pressure Rig was purchased in 1951. Disaster again struck on December 18, 1957, when a flash fire totally destroyed the Masonic building, including Russell's grocery store on the ground floor. Firemen from Holley, Morton, and Hamlin were called under Mutual Aid, and in freezing cold weather they helped prevent the fire from spreading to adjacent buildings. In 1961 the membership was increased to 85. With the purchase of a new truck equipped with a 750 gallon pump and a 1000 gallon supply tank, plus optional high pressure lines, the installation of water mains, and the Mutual Aid set-up, the community was now fairly secure from such disastrous fires that plagued it in the past. In 1964 the company entertained the motion for an addition to the hall that would connect the engine room and stone jug. After a year of discussion the project was approved and construction began in May of 1965. sometime in August. 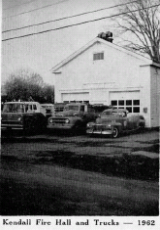 In 1965 Orleans County approved the forming of Fire Police within the fire departments and Kendall established their Fire Police with training to be taught by Sheriff Jack Williams.In October of 1965 the company purchased a 1965 cube van from Barry Dodge in Brockport to be converted into a rescue truck with the addition of shelves and equipment. Purchase price was $4239. The first aid squad was entertained. After much discussion it was decided that the department would start a first aid squad. A first aid course was scheduled for February and subsequent classes were held through the year and The Kendall Fire Department responded to its’ first 1st-aid call in October of 1964 international travel all ambulance from Superior Coach for $2100.The Ladies Auxiliary donated the needed supplies for the ambulance and the Kendall FFA donated a stretcher. Twenty members went to Albion Arnold patients. The ambulance was put in service in March and responded to its’ first call on March 7th 1968 with 6 total calls for the month. There was no charge for this service and that tradition continues to this day. In May it responded mutual aid to Hamlin for a fire at Duffy Motts. In October a first aid instructor’s course was held in order to allow us to do our own training. Also in October the alert siren was changed to cycle 3 times for anIn 1970 the department purchased monitors to be given to members to have at home to alert them of an emergency call. Over subsequent years the department held many split clubs to raise the needed funds toIn 1971 the department purchased a 1970 Cadillac ambulance from Superior Coach and the district took delivery of a 1971 Young Fire Equipment Pumper Tanker to be called Kendall 31. The total purchase price was $31,798. An extension to the Kitchen was approved at the February meeting in 1972 and in November the Jr. Fireman was first formed with 9 members. 1973, dispatch was moved to the Orleans County Sheriff’s Department. Before this there was a Fire phone at the Kendall Hotel. When the siren was activated the members would respond to the hall and someone, usually George Hanken, would go out on the porch and tell the firemen what the call was. Later on, a phone was also would ring. The first person to answer would start calling a phone tree.there would be no guarantee that they would last. A special meeting was held and a committee was formed to purchase a replacement. By July a new modular ambulance had been ordered. The ambulance was delivered in December with a total In March of 1977 the ambulance needed extensive repairs and cost of $23,900. 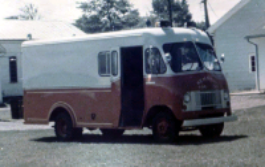 This ambulance was kept in service until 1994 In March of 1977 the ambulance needed extensive repairs and with a chassis replacement in 1985. A new pumper tanker to be called Kendall 30 was ordered from Young Fire Equipment in 1980. At a meeting in April 1980 the decision was made to build a new engine room. In August of 1981 a contract was signed with Morton Buildings for $97,000. The building was built in the same location as the old engine room and was completed in May of 1983. The mortgage was paid off in September of 1987. In July 13-1/2 acres east of the grounds was purchased from Walt Steffen. These lands were to be used for parking at Carnival and later as a ball field. Barclay and Fowler Oil Co. donated a used tank truck to the department in 1985. This truck was converted to a water tanker with the addition of compartments and a large diameter dump, at the rear, that the department members built themselves. A new chassis was placed under it in 1988. In September 1988 the Fire Department Drill Team was formed and began running foot races the following Sea Breeze Fire Department. They later built a new B-truck and continued participating in foot and motorized drills and representing the department proudly until 2003. March 4th -7th of 1991 brought a massive ice storm to our area. The department responded to 281 calls for pumping basements and wires down. We had assistance from as far away as South Lockport. In January 1992 Kendall 33, a new pumper-tanker purchased from KME, was delivered and put in service in February. In August the county’s 911 system was up and running. In 1994 a replacement for the aging ambulance was needed. The department only had $35,000 of the $75,000 needed. ($87,000 minus $12,000 trade in) A fund drive was held and the town generously supported their free ambulance service with $33,000 in donations. The remaining $7000 was financed and paid off the following year. In a sign of the times, that being less volunteers, an auto-mutual aid agreement was made with our neighboring departments in 1995. This meant that with the report of a possible structure fire the closest neighboring department would also be dispatched as well as Kendall. This also worked in reverse with us responding to them. 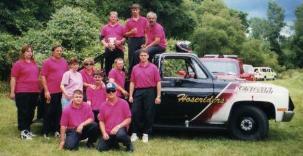 In March of 1996 the district purchased a used rescue truck from Henrietta Fire Department. The truck was refurbished by our members and Waters Auto Body and placed in service in May as Kendall 66. It replaced the 31 year old rescue Kendall 65.price was $189,000. In August of that same year Kendall was awarded one of the first FEMA AFG (Assistance to Firefighters Grant) grants in the sum of $56,700 to purchase new turnout gear for its members. The department applied in following years and was awarded 3 more grants. 2002 for $25,200 for with one truck. This truck (Kendall 34) was ordered in December of 2007 from E-One and delivered in August of 2008. The total purchase price was $473,879. All together these grants have saved the taxpayers of Kendall $438,000 over 8 years.